The baseball season is in full swing, and from the looks of it, the Marlins will experience yet another year of dismal fan attendance. It is a real shame because Marlins Park is a beautiful facility apart from its lime green walls and home run sculpture; however, money cannot buy wins, and losses cannot garner fans. Last year, the Marlins assumed fans would show up for the new ballpark, revamped lineup, and awesome promotions. They also assumed that wins would come with all of this. Almost none of that was the case. After the hype of the first two or so months settled, and the Marlins began losing, Marlins Park looked like a blue Sun Life Stadium, only smaller and more baseball-friendly. I thought that since the roster was diluted this offseason, and that fans now have even fewer reasons to want to show up for a Marlins game, the team would have some great promotional giveaways, and ticket prices would be lowered. Unfortunately, this year’s promotional schedule is less than impressive. But the Marlins still offer some of the cheapest tickets in baseball, so even though prices weren’t lowered with the expectations of the team, there still are some great seats available for relatively low prices. 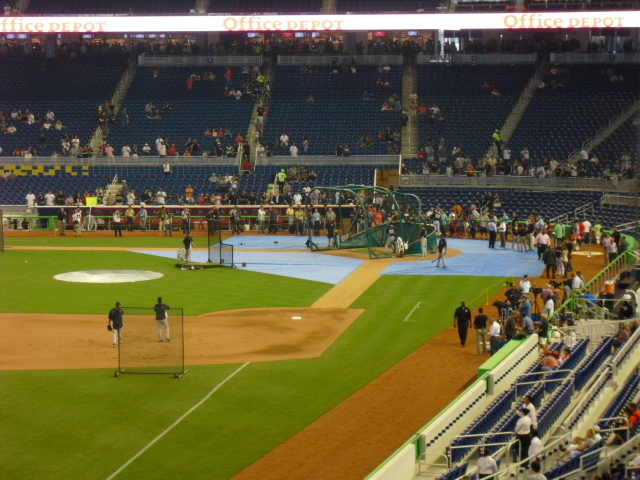 Therefore, the question is up for debate: Where are the best seats at Marlins Park? Just like on those annoying multiple choice tests looking for the “best” answer when there exist multiple that are correct, the term “best” in this case is rather ambiguous. Therefore, I will take into consideration value of the tickets for view of the field, view of the surrounding park, as well as foul ball territory. Thankfully, the latter two categories sport their best seats on the first base side since that is were the majority of the batters (right-handed) hit their foul balls, and is also where fans can gaze through the left field windows at downtown Miami. In addition, I am not going to consider home run territory since Marlins Park may be the worst in baseball for the possibility, or lack thereof, of catching homers. Lastly, unlike in my breakdown of Nationals Park where I considered food options in grading a section, good food exists all throughout Marlins Park, and, since I’ve never actually eaten there, it’s not mine to judge. Note: Please reference this Marlins Park seating chart below, with section numbers. Single game ticket prices vary depending on the individual game. Left Field: The Left field reserved sections above the bullpen and Clevelander are high above the field and with their backs to the view of the city. At $15-30 per seat, the value is not bad, but there are many better locations in the Park. Baselines: The baseline reserved sections along both sides of the outfield range from about $20-40 each. The views get better the lower and closer to home plate the seats get, but the prices go up proportionally. The foul ball location for these areas is not bad, but since the sections are relatively wide, an aisle seat or empty row is necessary for any decent chance of catching a ball. The better view is on the right field line, as fans are looking straight on into left field at the city. In addition, the out-of-town scoreboard, positioned in left-center field, is in better sight for those along the right field line. The baseline reserved VIP sections are priced at $47 for a single game. The value is not bad for its relative location, but the sharp angle looking right down the third base line is a deterrent, at least for me. Base Reserved: These sections stretch from first or third base to short outfield. From $28-58 per seat, the price isn’t bad when compared to similar seats in around the league. Again, the first base line folks have, overall, a better view. Home Plate Box: From $42-100 per seat, the home plate box sections sport some of the best views in the building. Prime foul ball range would most likely be towards the back of sections 12 and 13; however, there is no cross-aisle in these areas, and the press box overhangs the last few rows of each section. Therefore, the limited mobility greatly reduces ball-snagging chances. The best views, in my opinion, would be in sections 10-12 or 16-18. Sitting directly behind the plate all but eliminates depth perception; being offset by a small amount is beneficial to the spectator. Diamond Club: As in any park, Diamond Club prices are not for the faint of heart. These seats do not even appear on the Marlins single game ticket listings, so they may be sold out to season ticket holders. Despite the extreme proximity to the field, I believe better views of the action exist up in the home plate box. However, for one interested in food, the Diamond Club may be the way to go as food and drinks are complimentary here. Dugout Club: The Bacardi Dugout Club consists of three microscopic sections at the end of each dugout. The prices range from $115-$200 depending on the game and the section of the club. Food is free here as well. This “dugout club” is the prime characterization of the Marlins’ attempt to make things confusing for fans. There is no reason to put a partition behind the first three or four rows next to the field. Simply, the front office wants a reason to charge fans more money. Lexus Legends Level: These may be the best seats in the building. The elevation above the lower deck provides unobstructed views of the entire field. Again, the closer to the plate these seats are, the better the vantage point of the spectator. At $40-$50 per seat for a single game, these are by no means the cheapest tickets in the park, but for their unbeatable views, quick access to food, and a free parking pass for every two tickets purchased, these seats are hard to beat. 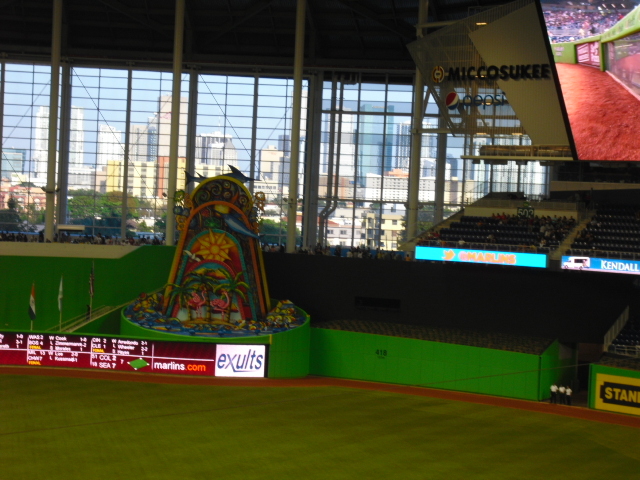 View of left-center from the Lexus Legends level, including Miami skyline in background. 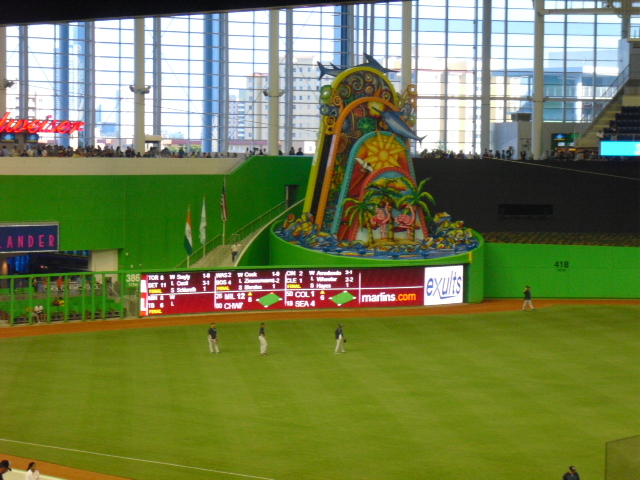 Other locations in the park like the Home Run Porch in right field and the third-deck Vista Levels offer relatively cheap seats, and since Marlins Park is cozy, the views of the field are perfectly suitable for enjoying a baseball game. However, since the Marlins have an average attendance this season of about 19,000–a number only held up by the Opening Night game–very few fans will probably sit in the higher sections. 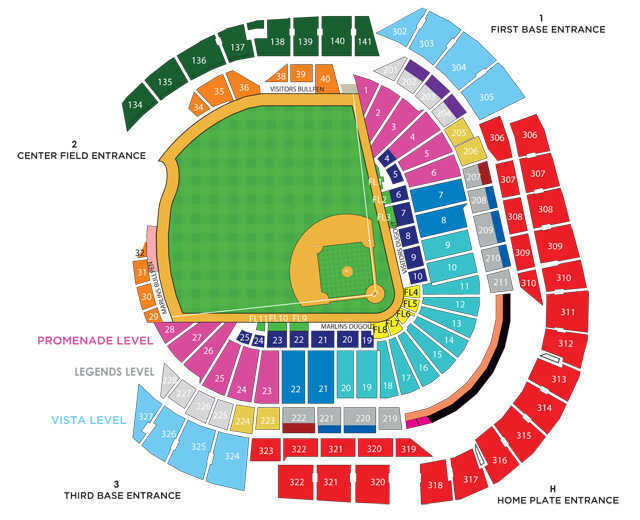 All in all, if I were purchasing season tickets at Marlins Park, I would be inclined to buy a seat in the Lexus Legends Level on the first base side, probably section 210 or 211. The Home Plate Box right below would be a good option as well. I hope to return to Miami in the near future for a regular season game, and I may compile a more extensive review of the park at that time. Excellent overview. Exactly what I was looking for. Very informative. Many thanks. Are there any published views of the actual seat rows? Trying to determine exactly where a row AA would be versus row 1 within the section etc. I don’t know of any seating charts that are that detailed. I know a lot of stadiums label their rows A-Z then AA-ZZ starting from closest to the field. At Nationals Park, for instance, the rows go A,B…Y,Z,AA,BB… With A being “row 1” and AA being “row 27” of sorts. Hope that helps! Thanks Steve! I was pretty sure that was the way it was, hope I can find some great seats, I prefer field level for being closer to the action. Does the Bacardi dugout club have complimentary beer or just the same kind of food and soft drinks in the all u can eat section is the Lexus legends level? Rich, I’ve never actually sat there for a game so I can’t be certain. But according to the Marlins’ website, the only seating sections that come with complimentary food and beverage are the Diamond Club and Hall of Fame suite. The Dugout Club comes with a parking pass for each 2 tickets purchased. Hope that helps!